I stumbled across an interesting personality test today (PersonalDNA — link below). As a fan of the old Myers-Briggs Type Inventory (based on Jungian types, but updated from his mythical worldview—I’m an INTP), I enjoy taking useful and interesting personality tests once in a while. However, I never get far from my suspicion that most people would self-identify with almost any random sampling of evaluations from most tests. One reason I like the MBTI or it’s non-professional offspring, the Keirsey Temperament Sorter, is that when I read the other 15 types, they don’t fit me (except, on a few occasions I’ve come out of the test as an ENTP or INTJ). One of the best books I ever read, that really helped me get a handle on why I thought and reacted so differently from my peers and friends, was Please Understand Me by David Keirsey. I had no idea we INTPs were such an exclusive segment of the population (2%)! The biggest thing I carried away from the book was not only a better understanding and acceptance of what made me tick, but a better willingness to accept others and their temperaments as not being “wrong” because they were not like me, and the accompanying attitude that I should not attempt to mold others into my own self-image. I was first introduced to the MBTI at a weekend leadership sponsored by Southwestern A/G College, my alma mater. I was a junior at the time, and the school counselor invited me to the weekend conference. I remember only one thing from the weekend, and it was an eye-opener for me. While sitting in the retreat chapel we were all given a booklet and pencils and asked to fill out this personality test. There were a lot of questions, over a hundred in all. After we filled out the test and scored our results, we were given a profile that corresponded to which of the 16 types we tested out as. Then, as a practical demonstration of how these 16 types are distributed throughout the populace, we identified our types and assembled with our fellow temperaments. Fifteen types later, I was literally all alone out of a group of 120 or so students. Alone. 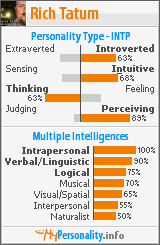 There wasn’t a single other soul in that group that tested out as the 16th type: INTP. The test I found tonight, PersonalDNA, is interesting too. I don’t know about its professional pedigree (it claims to have been developed with the help of psychologists), but the most interesting thing about it for me was the unusual style of answering the questions. Rather than providing only True/False answers (which drive me batty) this test gives the user sliders and two-dimensional plots and dynamic “buckets” for your self-assessment. I love that, on the front end. (There’s no telling how rigid and structured the scoring is, though. Just because a slider allows a potentially fine-grained answer, there’s no guarantee the scoring isn’t still binary). Anyhow, if you’re into this sort of thing, this was interesting. This test also allows others to evaluate you from the outside as well. ← One good shave deserves another: My bald son. Interesting. I am an INTP too. I once was a member of the INTP mailing list. It was increadibly annoying, as It felt like I kept getting into arguements with myself. I really enjoy your blog. You present ideas in a way that makes a lot of sense to me. Perhaps that is why. Your comment actually made me laugh. I almost thought this was a setup to a Steven Wright joke. Actually, I cannot imagine the pain of being stuck in a room full of INTPs. At first, we’d sit in silence, intuitively judging each other’s competencies, while imagining doing something more interesting, like reading a good book. But since we don’t have schedules, we really have nowhere else to be. So, we keep casting suspicious gazes, avoiding small-talk, until someone actually says something interesting–then we’re all talking at once, with persuasive arguments and unusual words. At then at the end, we’re all completely drained and convinced that while we were probably right, we also hope nobody else figured out how uninformed we really are. And, dangit, where’s my book? We INTPs are a poorly misunderstood lot. I’d take the PersonalDNA test, but my company Websense filter thinks it’s a game — ha! About 5 years ago I took the MBTI as part of a seminar/training class, and I came out ISTP. I don’t know how compatible I would be with you INTP’s, but we’re fairly close. Going through that stuff helped me to realize my (lack of) career track, and how I look for new challenges rather than sticking to a particular job. I have broken a personal record for longest at one job, where I have been with this particular one for 6 1/2 years and counting. My typical stay at a job had been 3-4 years. I understand, Marc. I have a hard time keeping interest in a particular “position” very long, unless the position poses new and interesting challenges to me over time. Thankfully, I’m working at a company now that is willing to take risks with employees by letting them have a chance to fail at something new once in a while! That enabled me to move from managing an interntet content production team to becoming an online media (streaming video, etc.) managing editor. It’s been fun. Longest stay at any one company, so far, was seven years at the A/G headquarters. I’ll hit my seven-year mark at CTI this coming August. I look forward to it! Hat tip to Josh Reighley for introducing me to the “MyPersonality” profile site and the clever badge below.